Hand painted porcelain stone in green & yellow. Trimmed with liquid Palladium & kiln fired. Set into a metal 6 1/2" silver costume bracelet. 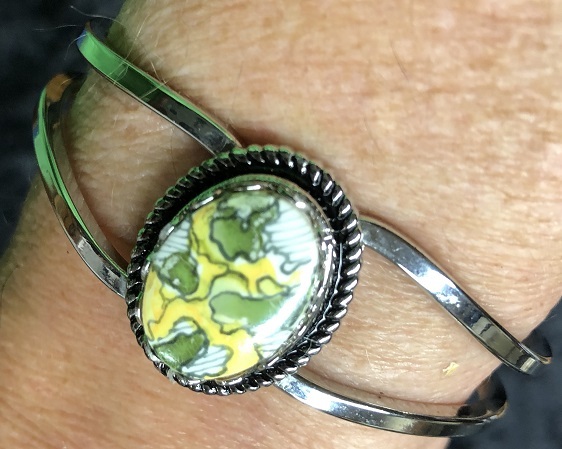 The bracelet opens up under the stone. Stone size is 13x18mm. Hand painted porcelain stones in gray, White & silver. Trimmed with liquid Palladium & kiln fired. Set into a metal 6 1/2" silver costume bracelet. The bracelet opens between the stones. Stone size is 13x18mm.